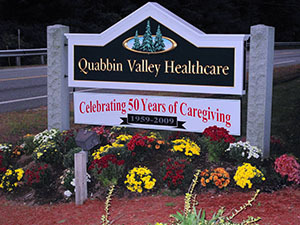 The rehabilitation department at Quabbin Valley Healthcare offers a wide variety of services to meet the needs of the diverse population we serve. We use the modalities of e-stim, diathermy, and ultrasound, and have established specialized protocols to address falls prevention, urinary incontinence, wound healing, and contracture and pain management. These new treatments allow us to help every patient reach and maintain their highest practical level of independence. The rehab equipment available at QVHC is state-of-the-art. They are the same modalities used by professional sports teams including the New England Patriots. Each therapist has undergone extensive training and competency testing in the use of these modalities. QVHC offers patients a unique rehabilitation experience. In addition to the modalities, you may be treated up to three hours in the gym. We have fitness equipment that includes a supine stander, bikes, treadmills and free weights to enhance your recovery. A stroke can occur at any time, leaving the most independent person dependent on others. Considering QVHC as a recovery center is a great idea. Re educate weakened muscles in proper contraction patterns. Decrease the synaptic space between neurons, creating a stronger, faster current to facilitate muscle firing. Work to decrease unwanted tonal changes in the limbs by exhausting the muscles that are over firing. Parkinson’s Disease is a slowly progressing, debilitating condition usually affecting a person’s strength, balance, and fluidity of motion. Often times people develop a short, shuffled gait pattern, have tremors and have difficulty completing simple activities of daily living. Re-train impaired muscles to recreate a normal EMG reading. This teaches muscles to fire precisely, improving the quality of gait. Improve coordination and decrease tremulous activity, which allows greater independence in self-feeding, bathing, and dressing. The Rehabilitation department at QVHC has had advanced training in the identification and treatment of wounds. Our wound care team consists of physicians, nurse practitioners, therapists, and registered nurses trained and certified in the care of acute and chronic wounds. Proper healing of a wound can take from as little as a few treatments to as long as several months, depending on the complexity of the injury and other medical issues. Modalities such as electrical stimulation and diathermy are used in conjunction with traditional treatments to improve the condition of chronic wounds and enhance the healing rate of acute wounds. Please send us your contact information by using the form below. Our admissions director will be in touch with you within 24 hours to discuss a convenient time for you to visit our facility!